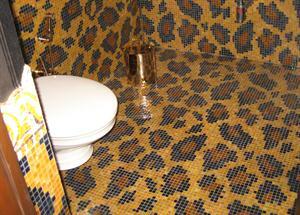 Do you also planning to change your bathroom flooring or redecorate your bathroom ? Here are some tips or ideas which you can use to select the right type of flooring for your bathroom. You can also read about the types of bathroom flooring available in the market and which one is suitable for your bathroom. Nice looking bathroom flooring can give stylish and royal look to your bathroom. Bathroom flooring must be hard, durable and moisture or stain resistant. Many number of bathroom flooring options are available now a days in the market. The following are some suitable types of bathroom flooring. Ceramic Tile Flooring for bathroom is best choice as it is easy to clean, scratch resistant and light in weight. This flooring is fire proof, bacteria- free and easily affordable. It is easiest to maintain as compared to other flooring. Terrazzo Flooring is very popular flooring now a days it is also popular by the name of Mosaic or Marble chip flooring. 'Terrazzo' floor is usually not slippery when wet because of many grout lines but requires polishing after some time to maintain its shine. This flooring is available in variety of textures and colors. Marble or stone flooring look very beautiful and also an excellent choice for keeping growing bacteria caused by dust particles under control in your bathroom. But it has one disadvantage as it become slippery when made wet. So it not good for kids and old age people bathroom. It's available in variety of shapes and colors. This type of flooring is flexible, unbreakable, water proof and easy to clean. This flooring is made up of very durable material and requires low maintenance. Additional benefit of vinyl flooring is that is among the least expensive flooring one can discover. It gives luxurious look to the bathroom. Though the Wooden Flooring is not very popular form of bathroom flooring but you can use this flooring If you treat them with oil finish every 4 months as it would save them from moisture. You can choose any of the above flooring according to your requirements and choice.